Running the Bases, is not the same as stealing bases, which has seemed to lose its luster in the major leagues, probably because it’s too hard to learn, but once you’ve reached base safely … you gotta know what to do next. Let me STOP right here …. You don’t require blazing foot speed, although that’s a real nice addition, to become a good base runner, which also includes stealing bases. But …. You do have to be Smart to run the base paths. 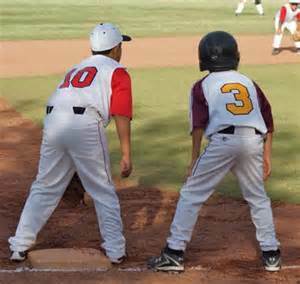 Whether you feel stealing a base is quite impossible, and you may be right, you still have to run base to base in order to score. Tagging up on a fly ball instead of going half way to the next base ... and so onb and so forth. There's a lot to learn, including developingbase running instincts. In this Learning Segment you and/or your players will learn “How to Steal” bases, what to look for, how to slide, how to know what a pitcher is thinking and many more valuable lessons. Do you know that an average speed player, who runs the bases properly, can possibly get from home to home quicker than a faster runner. It’s all in technique and knowing what you’re doing and you’ll learn that in these links. As I said, for whatever reason, the MLB has treated stealing bases like a red headed step-child, but we know at lower levels, up to and including minor league baseball, the ability to steal a base at an opportune time can make the difference between winning or losing. Let’s learn how to terrorize the base paths.